Humans are frugivores, a fact that might not surprise you if you've experienced the great pleasure of biting into a perfectly sweet, juicy mango, or tried a healthy raw food diet. We evolved from the same genetic line that spawned our closest relatives, the bonobos and chimpanzees, who feast on fruit and greens in the forests of equitorial Africa. Compare our digestive anatomy to that of a bonobo or chimp, and you'll see that there are only minor differences, and that we're primed to get our calories from fruit, while still consuming a fairly large amount of vegetables. In this article we'll review what seperates us from obviously-frugiverous chimps and bonobos, what these differences imply, and what researchers have to say about the matter. Aren't Humans Too Different To Be Frugivores? Humans are capable of digesting hamburgers, milkshakes, and sweet potatoes, but this doesn't change the reality of our frugiverous digestive anatomy. 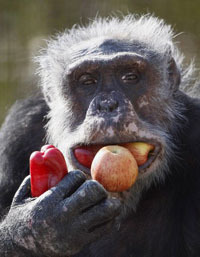 Chimps and bonobos are almost equally capable of eating cooked human food, and even junk food. They actually request it by preference when they've been exposed to it in zoos. It appears that the great apes are just as suseptible to food addiction and dietary mood alteration as humans are, but no primatologist would ever suggest that cooked food is the ideal food for chimpanzees. Why, then, do they say it's the ideal food for humans? After humanity's divergence from the genetic line that produced the extant great ape species, we underwent a number of changes. We gained the ability to produce more of the starch-digestive enzyme amalyze, (but we still have but a fraction of the production capability of true starch eaters, like pigs). Our jaws and teeth also underwent some changes. But the most important shifts occured in our intestines. Our guts shrank, the small intestine became longer, and our cacum (appendix) and colon shrank. This reduced gut volume means we're no longer capable of eating the large quantities of food that a bobobo or chimp can consume with ease (1). The increased volume of the small intestine means that we now have the ability - and, paired with the gut volume shrinkage, the need - to digest foods that are of a more highly concentrated nature. In times of low fruit availability in Africa, chimps are capable of consuming huge quantities of low-calorie leafy vegetation to meet their energy needs, but that approach won't fly for us. This is why the whole fruit vs vegetable debate, and the "overhybridized" fruit debate, are fairly nonsensical - calorie-rich fruit is ideal for us. Sugar absorption occurs in the small intestine, so humans can uptake more sugar than chimps in a given time frame. It's probable that as we gained this ability, our need for lower-energy vegetation diminished, and our cecum and colon shrank. Our cecum holds the bacteria that breaks down indigestible fibrous plant materials, so as it shrank, a dietary path closed for us, as another opened up. But Didn't Cooking Change Us? Can we still be frugivores after thousands of years eating cooked food? How many of our anatomical changes were brought about by a cooking and consuming high-energy roots and tubers, and how much was a continuation of the fruit-eating path we were already on, is debatable. But whatever the reason, we now prefer and thrive on lower-fiber, higher calorie foods. This isn't anything new, actually. Primatologists have observed primates all prefer high-sugar fruits as well, but have less access to them in the wild. Many have suggested that evolution has left us unable to consume a fruit-based raw food diet, such as Richard Wrangham, author of "Catching Fire". Yet his analysis is somewhat flawed, as I discuss In my book, Raw Food Weight Loss And Vitality, which suggests that we eat with the assumption we're frugivores. The general consensus of researchers is that the thousands of years our species years spent as hunter gatherers had very little effect on our digestive anatomy (1). Sure, we're now capable of eating a wide variety of foods due to cooking and our flexible digestive system, but it doesn't mean that they're now ideal for us. We're quite capable of consuming a frugiverous diet and thriving on it. Although experts might not throw around the word "frugivore," academics and those in the medical field regularly comment on how well equipped we are by evolution to digest fruit. Katharine Milton of the University of California, Berkley, is one of the most prolific and well-respected authors on the topic of the dietary ecology of Primates, with a special focus on how primates relate to modern humans and our human ancestors. "The widespread prevalence of diet-related health problems, particularly in highly industrialized nations, suggests that many humans are not eating in a manner compatible with their biology. Anthropoids, including all great apes, take most of their diet from plants, and there is general consensus that humans come from a strongly herbivorous ancestry. Though gut proportions differ, overall gut anatomy and the pattern of digestive kinetics of extant apes and humans are very similar. Analysis of tropical forest leaves and fruits routinely consumed by wild primates shows that many of these foods are good sources of hexoses, cellulose, hemicel, celulose, pectic substances, vitamin C, minerals, essential fatty acids, and protein. The recommendation that Americans consume more fresh fruits and vegetables in greater variety appears well supported by data on the diets of free-ranging monkeys and apes. Such data also suggest that greater attention to features of the diet and digestive physiology of non-human primates could direct attention to important areas for future research on features of human diet and health (2). Hans Georg Dehmelt won the Nobel Prize in Physics in 1989 for his development of the ion trap technique, but being a man of wide interests, he's also published two papers on a far different subject: the suitability of fruit-based diet for humans. "Their (bonobos and chimps) well-known current, obviously raw diet... is still the healthiest diet also for Man because for about twenty million years it has been eaten by the common ancestors of Man and Chimp. They did not fall for the extremely unhealthy practice of cooking their food. All later diets up to the current Big Mac diet of the broad American masses increasingly rely on foodstuffs such as meat, grains, beans and potatoes that have to be made edible by cooking and were only adopted under exponentially increasing population pressures. Consequently, all are less healthy and moreover they are the less healthy the later they were adopted. Approximating the Chimp diet by suitably supplemented supermarket items may give us the best of both worlds (3). Urologist Donald S. Coffey, Director of the Brady Research Laboratory at Johns Hopkins University, was a well-respected expert on cancer. Shortly before his death in 2004, he summed up what Americans needed to do to improve their health and ward off cancer. "In summary, we were not biologically selected by the evolution process to eat the way we do today, and the damage is manifested in prostate and breast cancer. Indeed, all of the present suggestions of the National Cancer Institute and the American Cancer Society as to how Americans might reduce their chances of getting prostate and breast cancer revolve around adapting dietary changes in our lifestyle back toward the early human diet of more fruits; a variety of fresh vegetables and fiber; less burning, cooking, and processing; diminished intake of dairy products, red meat, and animal fats, as well as decreasing weight and increasing aerobic exercise. That is, we must return to a diet and lifestyle that more closely matches the first 135,000 years before technology modified our lifestyle and diet. (5)"
There's no need to fear fruit. 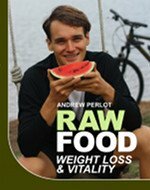 A raw food diet based around it is the healthiest way to eat. 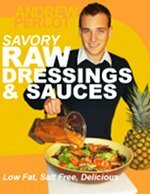 If you want to thrive like never before and eat in accordance with our digestive anatomy, check out my book, Raw Food Weight Loss And Vitality. 1) Milton K. 2000. Hunter-gatherer diets – a different perspective. Am J Clin Nutr 7(3):665-667. 5) Coffey, DS "Similarities of prostate and breast cancer: Evolution, diet, and estrogens." Urology. 2001 Apr;57 (4 Suppl 1):31-8.